The Old Police Station Waterhole boasts permanent water in a tranquil setting, accommodating many bird that take refuge in this oasis. 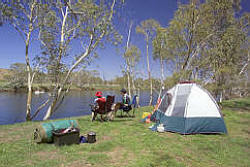 Bush camping sites are available by the waters edge and a small camping fee is applicable. A short walk on the other side of the waterhole you will find the original Police Station. Facilities include camping platforms for food preparation and a toilet. For further information, visit Parks and Wildlife or phone on 08 8962 4599 or the Tennant Creek Visitor Information Centre on 1800 500 879.